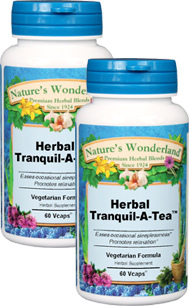 Herbal Tranquil-A-Tea™ - 550 mg, 60 Vcaps™ each (Nature's Wonderland) - Penn Herb Co. Ltd.
Herbal Tranquil-A-Tea™ quiets your nerves and gently soothes away the tension... without any narcotic side-effects. Our relaxing blend calms, and assists in overcoming nervousness and occasional sleeplessness due to common, everyday overwork and fatigue. Awake refreshed & renewed with Herbal-Tranquil-A-Tea. As an addition to the daily diet, take 1 or 2 capsules 3 times daily with water at mealtimes. THIS PRODUCT CONTAINS BLACK COHOSH, WHICH IS NOT TO BE USED DURING PREGNANCY OR WHILE NURSING.